They can increase a property’s value by 20%. Maintaining your trees is essential to maintaining their health and to mitigate the risk or personal injury or property damage. Late summer or fall is the time to do your planning, budgeting and scheduling for tree inspections. Winter is the best time for an arborist to inspect, since the leaves have fallen the tree’s architecture can be seen. Any deadwood, fungus, cracks and other symptoms can be easily seen. Your tree care plan is dictated by tree species, age, function and placement. 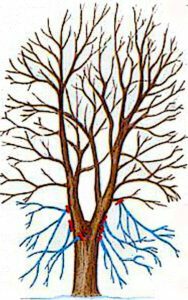 Corrective pruning where a tree has suffered physical damage, broken or overlapping branches, double leaders*. 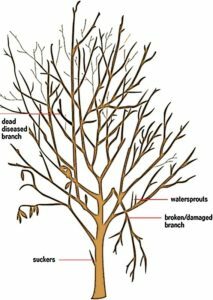 Pruning to remove disease-infected parts from trees. 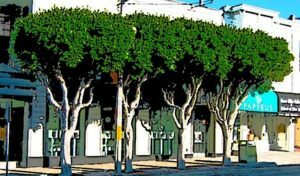 Trees growing too close to buildings are a fire hazard. Thinning out the top and sides or just removing individual limbs of the trees thins its overall mass. Pruning for health includes proper thinning which helps prevent disease and loss of vigor. One example is Japanese Maple (Acer palmatum) in which this kind of pruning can encourage its beauty. Another reason for aesthetic pruning is to stimulate flowering or fruit production. Formative pruning will guide the tree to its appropriate form. It will also correct structural deficiencies. Gardeners’ Guild can assist you in developing a tree care plan and budget. It’s part of our maintenance service.